Outdoor patio umbrellas have to put up with a lot of different kinds of weather, and it’s easy for them to their cover torn. Replacing good patio umbrellas can be costly. Repairing a torn umbrella cover is a much more economical choice. The best way to repair an outdoor umbrella that has a hole or is suffering from a tear depends on what kind of fabric the umbrella uses for its cover and the severity of the damage. Here are a few guides on repairing you patio umbrella and how to maintain it tear free after. If damage occurs to your patio umbrella, it is most like to be either a tear in the fabric along the ribs of the extension mechanism, a hole punched through by accident, or fraying along the edges. The first step in repairing is assessing the damage and assembling the required materials. You will need heavy-duty scissors, heavy-gauge thread that matches your umbrella fabric, fabric glue and heavy objects to weigh down glued fabric. If the fabric has a hole, you’ll need a piece of compatible material for your patch. To prepare your umbrella to be repaired first you should remove the umbrella fabric from the ribs by pulling the pockets from the rib end, the remove the finial and slide the cover off of the umbrella frame. Spread the umbrella fabric on a flat surface. Your patio table is often a good surface for this. Clean around the damaged area and remove any dirt or twigs. Using the scissors, snip away loose threads. If the tear is on a seam, all you need is to remove the fabric from your umbrella and sew a stitch right along the tear. It’s very easy to do this on a sewing machine, but you could hand sew it to. Just make sure to use heavy-duty outdoor or nylon thread. If your patio umbrella has a long tear, bring the torn edges together, allowing them to slightly overlap. Apply fabric glue to the facing surfaces. Keeping the fabric flat and still. Place weight on the overlapped fabric to allow the fabric glue to bond. When the glue is set, stitch to reinforce. Be certain not to overlap the fabric too much or the large patio umbrella will not open fully. For a small tear where the edges can be brought together, adhesive is usually not necessary. Stitch the tear closed. Again, overlap the fabric as little as practical. If the tear is not on a seam, it’s time to patch instead. Check your local fabric store for outdoor material that’s as close as possible to that of your umbrella, or try an online fabric source such as outdoorfabricsite.com. If you’re umbrella is using a premiere fabric like Sunbrella or Outdura, these fabrics are readily available online. Cut a piece about an inch or so wider than the damaged area, fold under the edges, then stitch the patch in place. Because umbrellas are visible from both top and bottom, you may want to patch the underside as well. If sewing isn’t your thing, talk to a local tailor or outdoor furniture retailer and see if they’ll do it. If a hole in the fabric is shaped so that the edges cannot be brought together without bunching the fabric, begin as with a tear. If a portion of the edge of your patio umbrella begins to fray, you have a repair job waiting to happen. Address fraying early, and you will save you a TON of work later. Begin by clipping away loose material. With the frayed area cleaned up, stitch along the new edge. You can leave a slight scallop in the edge of the umbrella. Scallop? Yeap, scallop. It’s going to look a heck of a lot better than the tear that will appear if a frayed edge is left untended. To prevent new tears or holes, don’t leave your umbrella up when not in use. 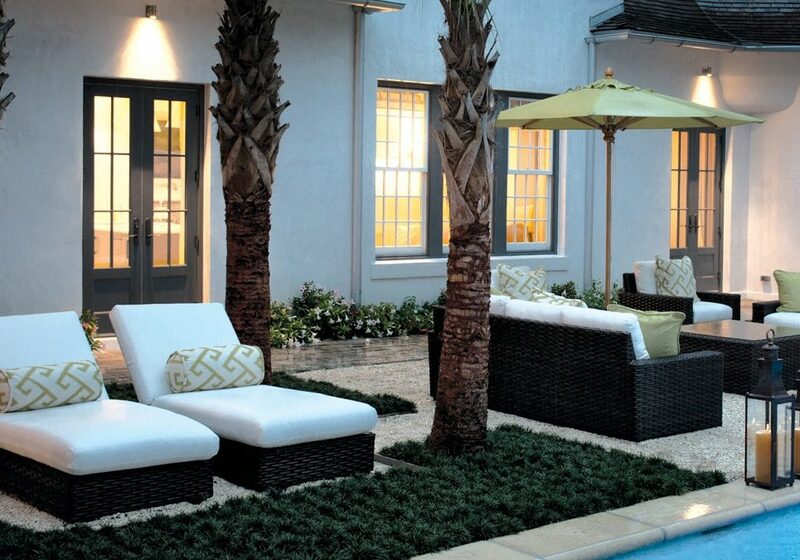 Patio umbrellas that are up can easily fall over and roll into shrubs or furniture and are more likely to be punctured or torn by falling debris. Store your umbrella where mice or other critters won’t be able to chew it, or poop on it. Yeap, animal waste will rot and deposit living enzymes that like to chew through stuff, including umbrella covers. Currently have a outside umbrella that is 12 years old. We believe it needs to be replaced with new fabric. Dimensions are 6×9 . Can you replace the fabric cover and some kind of a idea on cost? Older umbrellas are harder to fix or replace covers because design changes have been happening over the years. I would definitely contact your local patio shop to see if they can custom order a cover for your umbrella.